Co.,ltd, national quartz enterprise symposium held successfully in Nantong Guanghua international hotel. In the morning of May 23, 2013, sponsored by quartz professional committee of China Architectural and Industrial Glass Association, co-sponsored by boquartz Co.,ltd, national quartz enterprise symposium held successfully in Nantong Guanghua international hotel. 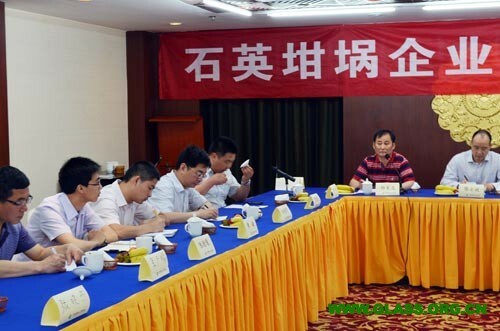 Electronics Association director Lu Jin, the quartz branch director Chen Shibin, and parts of representatives from some domestic crucible manufacturing enterprises, a total of 18 people, attended the meeting. Yang Jiamao, director of the quartz professional committee Secretariat of China Architectural and Industrial Glass Association, held this meeting. After 10 years of rapid expansion and high speed development, photovoltaic industry began to nosedive in the second half of 2011. Along with the execution of American “double against”, the industry was faced with severe overcapacity, falling prices, and blocked export. In 2012, a lot of the enterprises’ output was reduced and parts were shut down. Prospects for the 2013 pv industry development were more dim, especially the EU “double reverse” added the gloom. The whole industry would certainly be faced with large integration. Parts of the enterprises would change the “shut down” to “go bankrupt”. In this tough economic environment, the crucible, asthe upstream of photovoltaic industry had also been impacted severely. Under the background of the economic crisis, the crucible enterprise symposium held. The delegates from domestic crucible enterprises delivered a speech and exchanged views on the current economic situation and future company development. All had a deep understanding of rigorous economic situation and actively discussed the counter measures; For the present the disorder price competition and malicious arrears influenced crucible a lot. For this point, almost all the companies shared the same feeling. With regard to the competition and trend of monocrystal and multi-crystal, people also had a complete discussion. Because of current price issue, polycrystalline silicon solar cell was better than single crystal cell in terms of sales. Everyone also carried on the communication about the quality of the single crystal of crucible and thought the quality of crucible could be further improved. At the end of the meeting, each representative discussed the current quartz crucible standard. Most of them believed that the current industry standard was too low to adapt to the industry development and needed amendment. People changed opinions, in terms of current industry trend and product quality, and reached the following consensus: 1. Facing severe market environment, crucible enterprises should be self-disciplined and should compete orderly; 2. For the sake of informationization development of crucible industry, with the organization of industry association, crucible industry data statistical work should be done well; 3. Industry association organized to revise the current criteria of quartz crucible.